What a busy February has been. I haven’t seemed to be able to stop, travelling to Orange in the central west of NSW where I saw the roses, and around the north coast as usual. 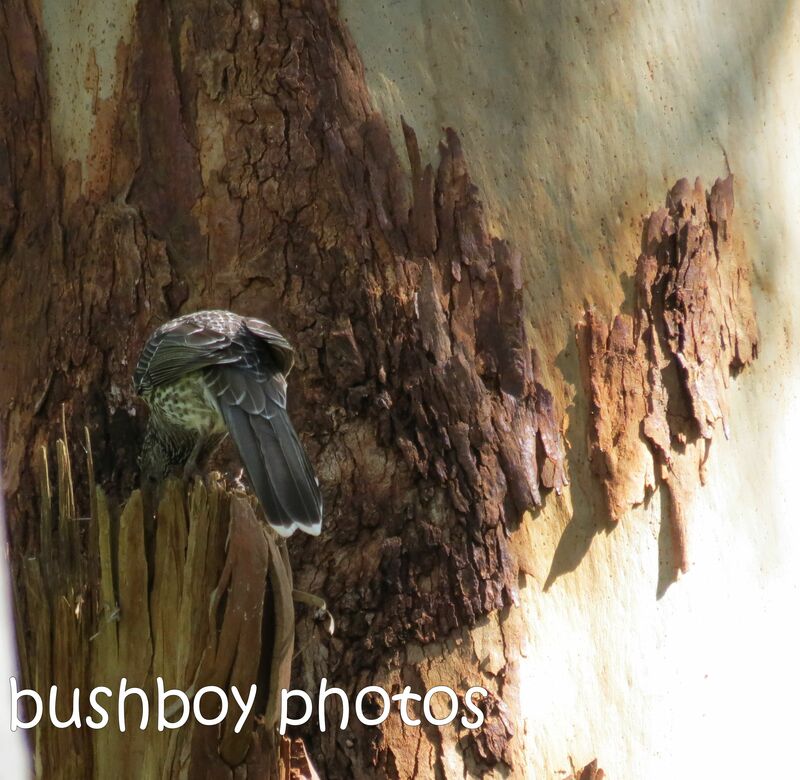 I have seen so many new things as well as some birds and insects to photograph. Here is a batch of birds and insects plus a flower and some clouds found in early February. I am still going through the last lot of photos to find some pretty things for you. 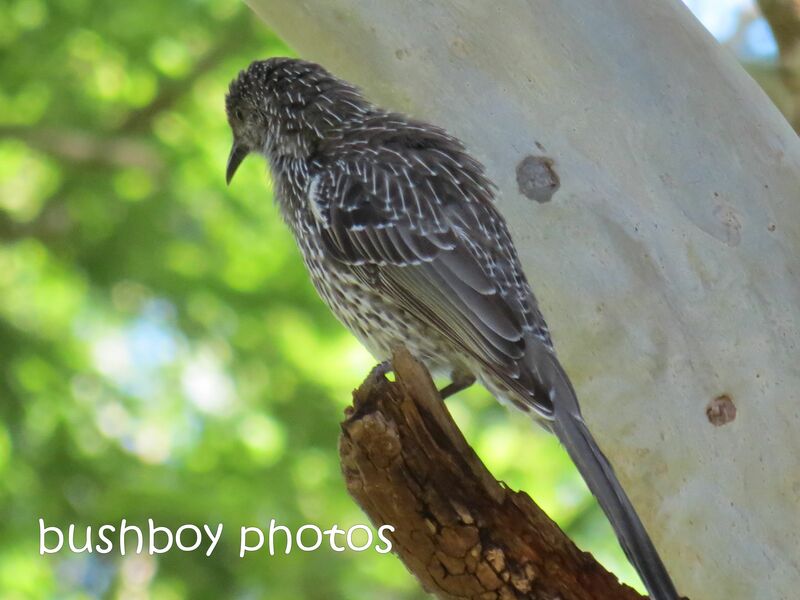 I found this little wattle bird sitting on some broken branch of a eucalypt gazing into some loose bark. In a flash he jumped over to the bark and started digging around. 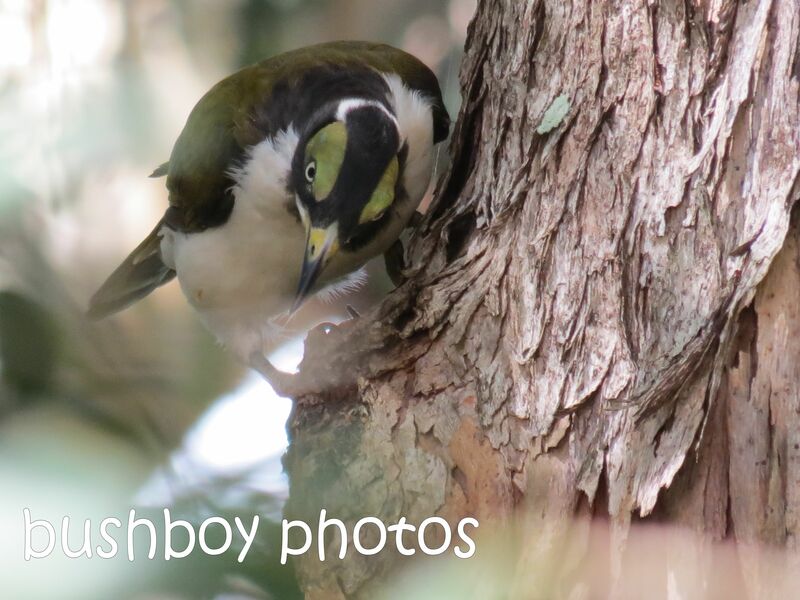 Nearby, a young Blue-faced Honeyeater was looking rather intense don’t you think? 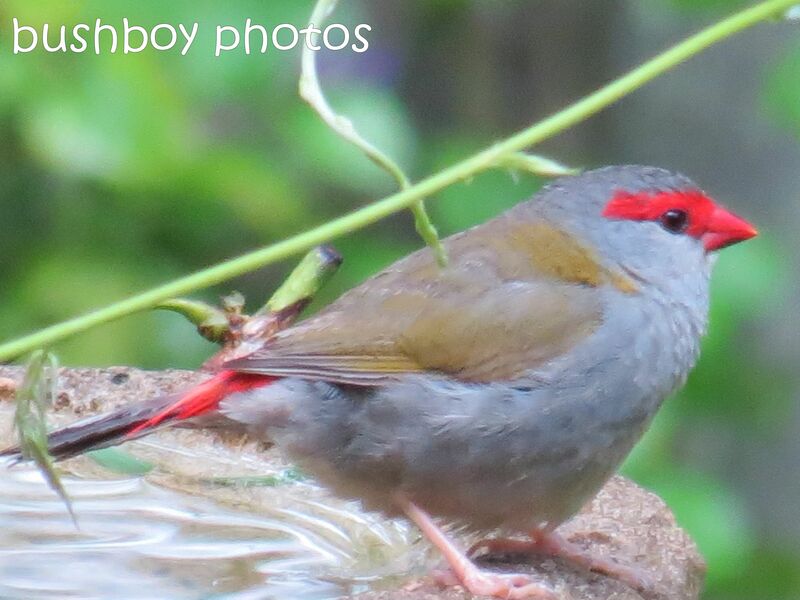 The Red-browed Finch was happy to have a bath. High up in the trees this crazy bird was just sitting there like this for ages. 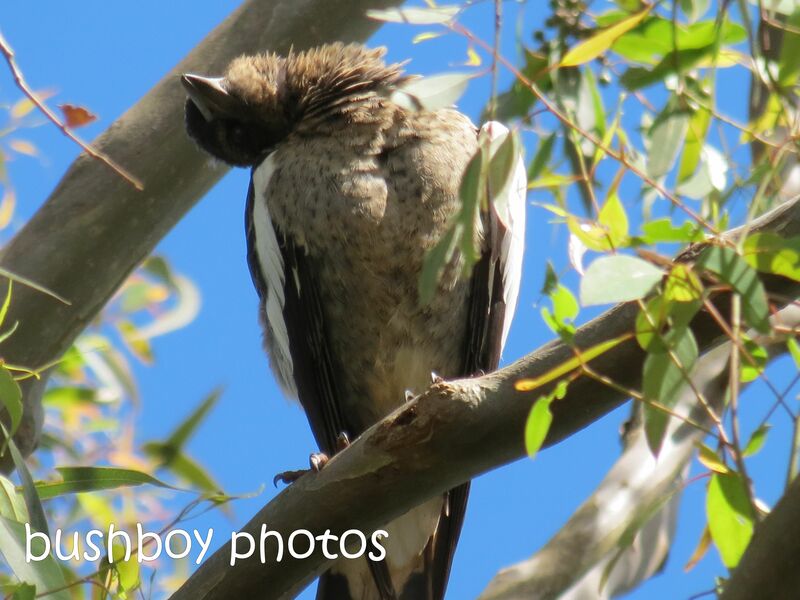 Some Twitter folk have suggested “bird yoga” or just chilling and “catching some rays”. Either way it was funny to see. 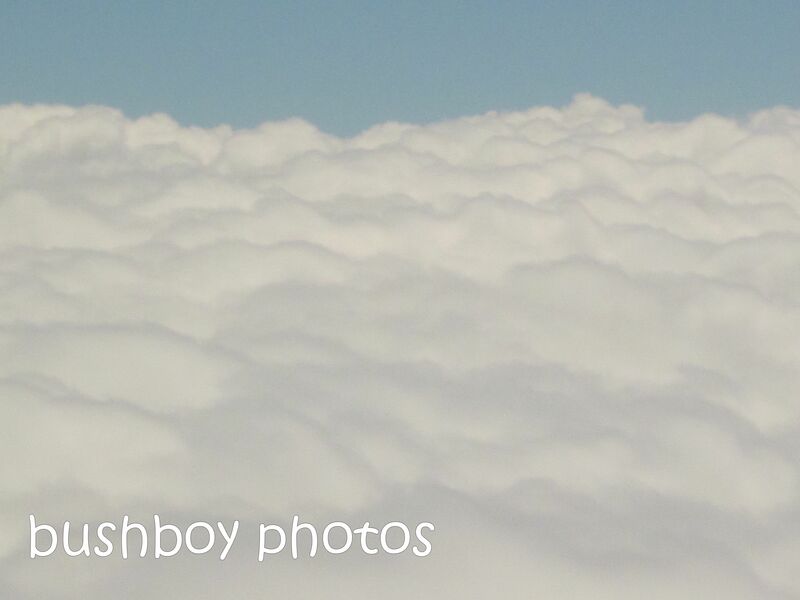 I love clouds when you’re above them. They can look surreal. 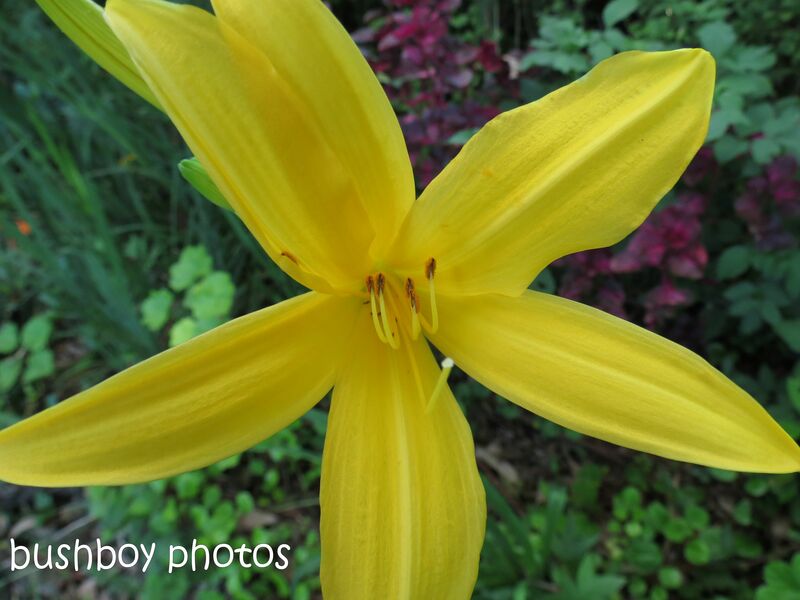 This is the only flower photo, a day lily, as some of the others weren’t very good but the next blog may have more as you seem to love flowers as much as I do. This part of Summer is when there are heaps of butterflies around. I have spent quite a bit of my days chasing butterflies lol. 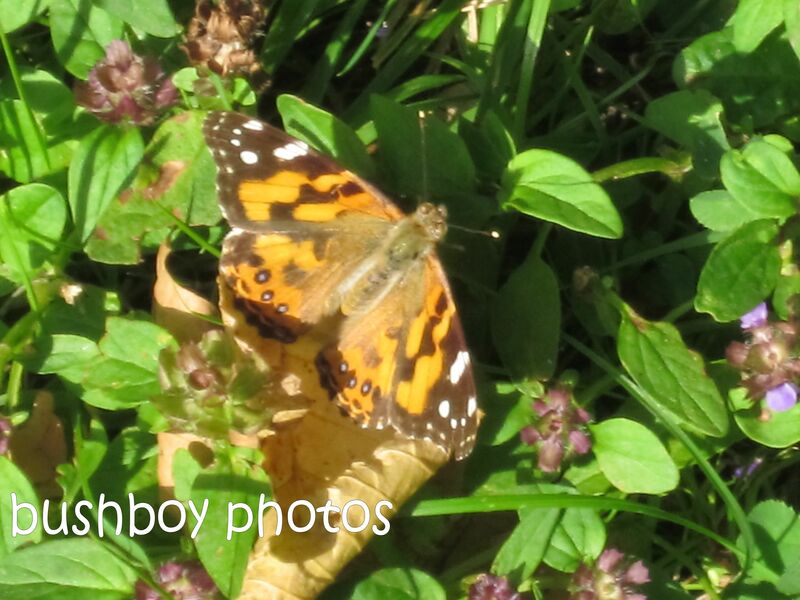 I think that this is an Orchard Butterfly. 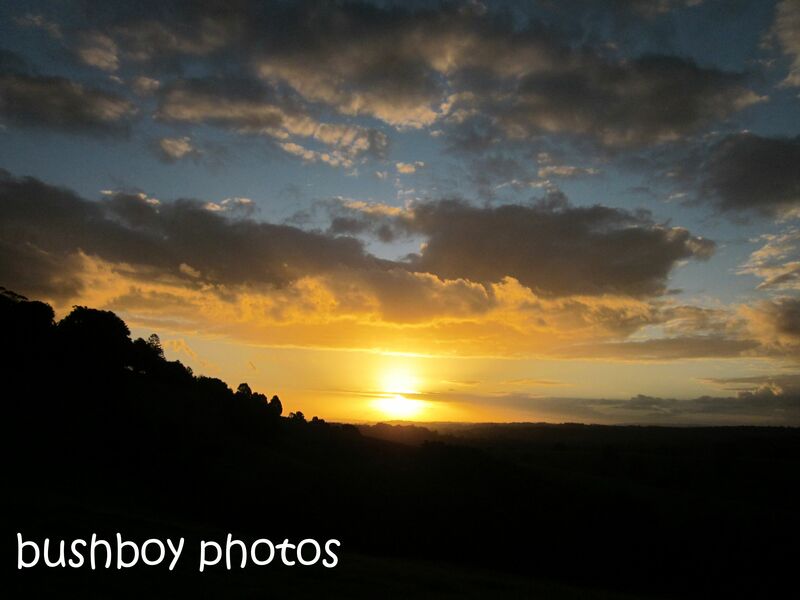 The photo was taken in the twilight in Orange. It was high in the pine when it finally stopped. Another butterfly from Orange is this Australian Painted Lady which perched on the ground and only moved a short distance when I came too close. I chased this Albatross around for ages as it kept disappearing into the foliage at home. 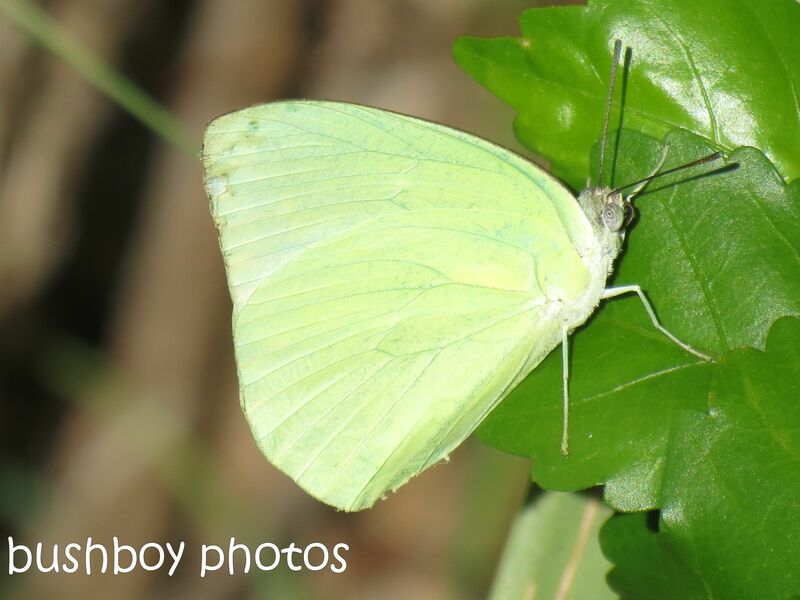 I saw a white butterfly flying around one afternoon and when I finally found where it was perched it was so different to the white butterfly I was chasing. You can just see the white on the edge at the rear of the wings. 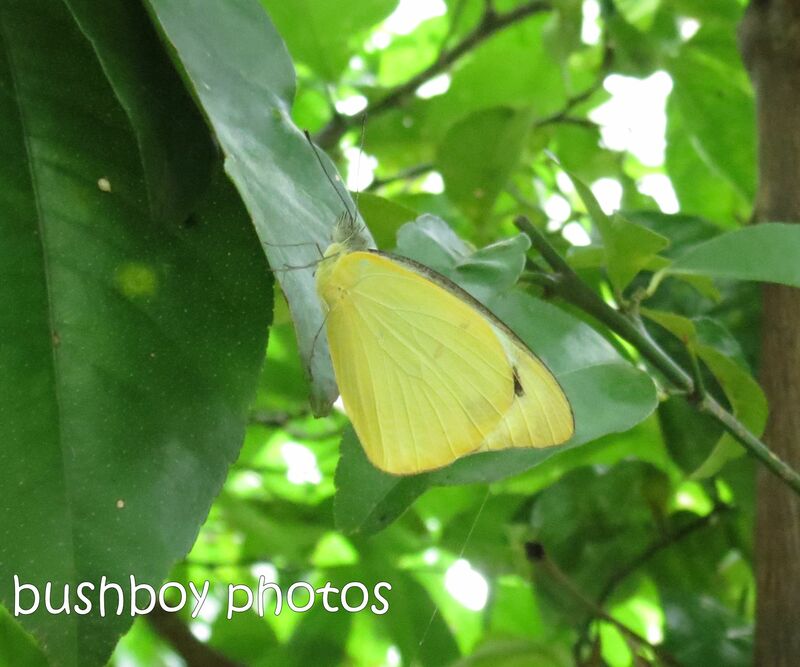 My garden has been full of Lemon Migrants flitting about the Cassia and on the Pentas. My garden always has Line Blues flying about. They are so funny when the come across another Line Blue as the get into a spiralling and suddenly break away and continue their flitting about. This is one of only photos I have of one with its wings open. I love it when the Dragonflies come buzzing about. They have been zipping alone then hover for a bit and suddenly take off in a direction that I never can pick. 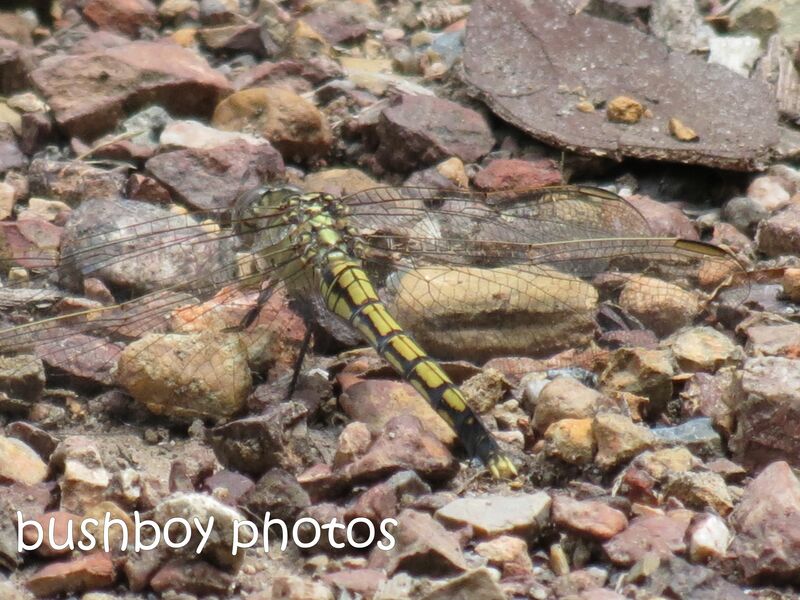 This dragonfly kept setting down on the ground making it easy to photograph. 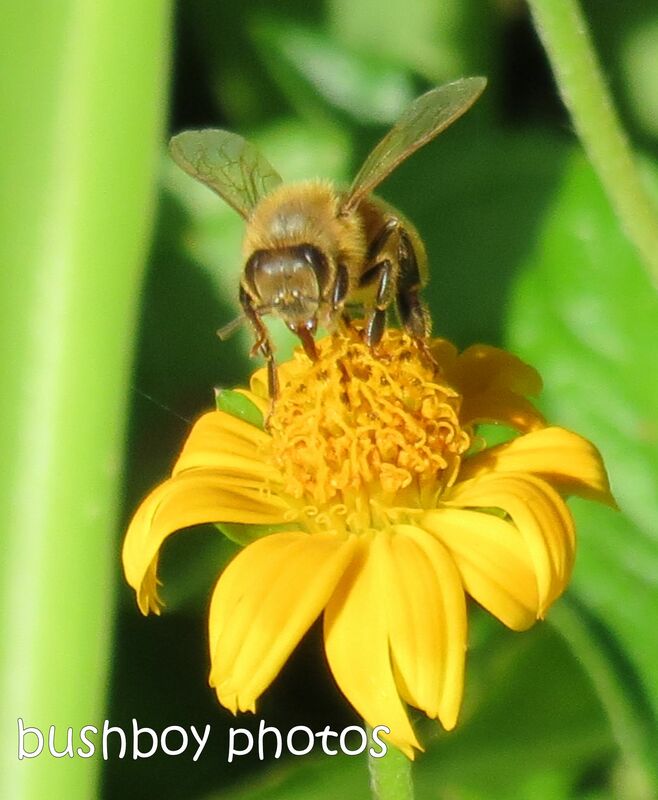 I also have spent some time chasing bees. They do make it easy to photograph when they stop to collect a bit of pollen but always seem to have a wary eye open for me. Another part of Summer has been some spectacular sunsets. That’s all for February so far. Back to sorting the photos for the next blog. Hope you enjoyed seeing some of my February finds. You’ve found a lot this February. It is interesting seeing what others have seen around the place. It is so hard getting butterfly photos, you must have plenty of patience. The bird look ridiculous sitting in the tree like that. 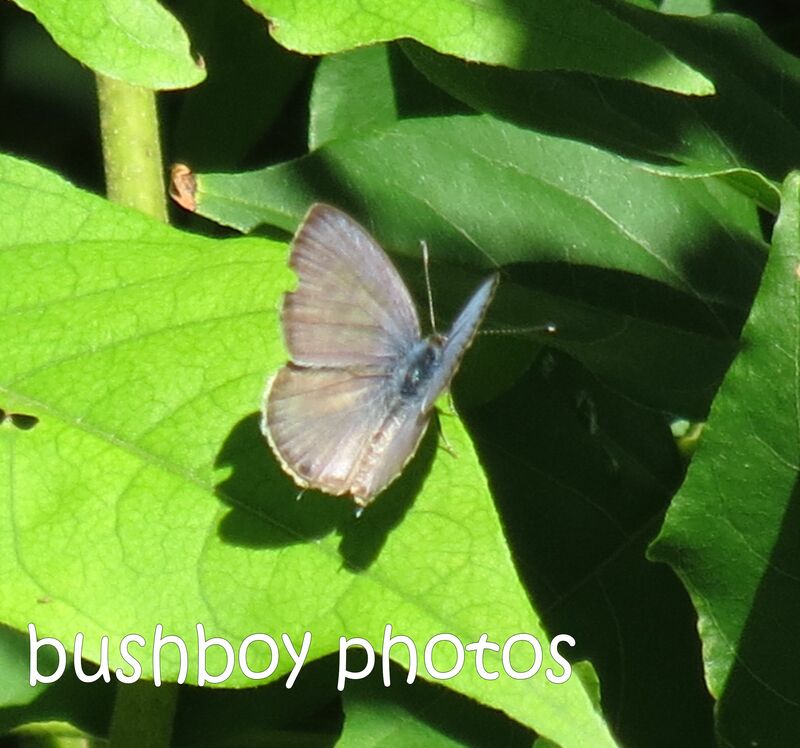 I am getting better photographing butterflies….the photo you see is probably the best one of about twenty photos. Trying to get them flying is so hard. That bird was so silly looking wasn’t it? beautiful …love the twilight picture especially.